Serving the Commonwealth through offices in all 32 judicial districts, the magistrate’s primary functions are to conduct probable cause hearings on complaints of criminal conduct brought by law enforcement or the general public and to determine whether an arrested person is eligible for bail. The magistrate system for the Commonwealth is divided into eight regions, and each magistrate is authorized to exercise his or her powers throughout the magisterial region for which he or she is appointed. 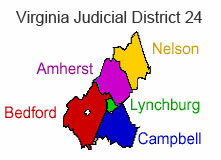 Each region is comprised of between three and five judicial districts. There are magistrate offices located throughout Virginia, including at least one in each of Virginia’s 32 judicial districts.